In honor of the Superbowl, we present our Burger of the Month: the Pigskin Burger. We’ve piled on many delicious ingredients for this burger. The Pigskin Burger starts with our original 100-percent ground-chuck burger, topped with smoky pulled pork, smothered with Kilauea Fire BBQ sauce and… BACON. 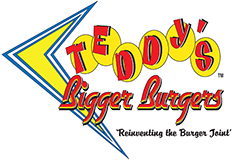 Sprint down to your nearest Teddy’s Bigger Burgers location and get one NOW. Didn’t break a sweat from that sprint? Don’t worry, the nice heat from this burger will take care of that for you and your taste buds. What if you’re just craving some of our delicious BBQ pulled pork? As always, we try to cater to our customers’ tastes. We have a Plan B! Introducing, our BBQ Pulled Pork Sandwich. One bite will fill your senses with savory, rich, meaty goodness. The perfect companion to February’s Burger of the Month is our Shake of the Month: the Banana Split! Are you a fan of ICE CREAM?! ARE YOU? Let me here you SCREAM!!! Alright, that’s enough. This shake is a blended trifecta of our favorite ice cream flavors, Banana, Chocolate and Strawberry. Every spoonful will bring you back to your childhood of decadent banana splits.